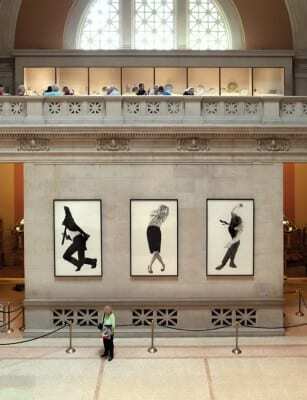 In late 2012, Karl Haendel entered a room in The National Gallery in Washington, DC, and before him stood Knight’s Heritage. The Knight’s Heritage. Here was the original sculpture Anne Truitt created in 1963, the very sculpture Haendel had labored so hard to reconstruct eleven years ago without ever seeing the original in person—until now. Haendel knew that sculpture so well, knew every inch of it (or so he thought). It was like running into an old, long-lost friend, maybe even a lover—or better yet, meeting a relative in person for the first time after knowing them only through pictures and stories. Haendel recalls the experience as deeply emotional, surreal, odd, strange, and wonderful. He felt a strong desire to put his arms around the sculpture and embrace it. In a sense he had already seen the work before, but of course not really. Knight’s Heritage was deeply familiar and at the same time not familiar at all. It was an uncanny experience. That same season would be marked by another set of uncanny encounters, experienced not by Haendel but by friends and colleagues who were attending Art Basel Miami Beach in December 2012. During the opening days of the fair, Haendel, who did not attend, received a series of e-mails and texts from people who claimed to have seen a drawing of his, but it was not credited to Karl Haendel. 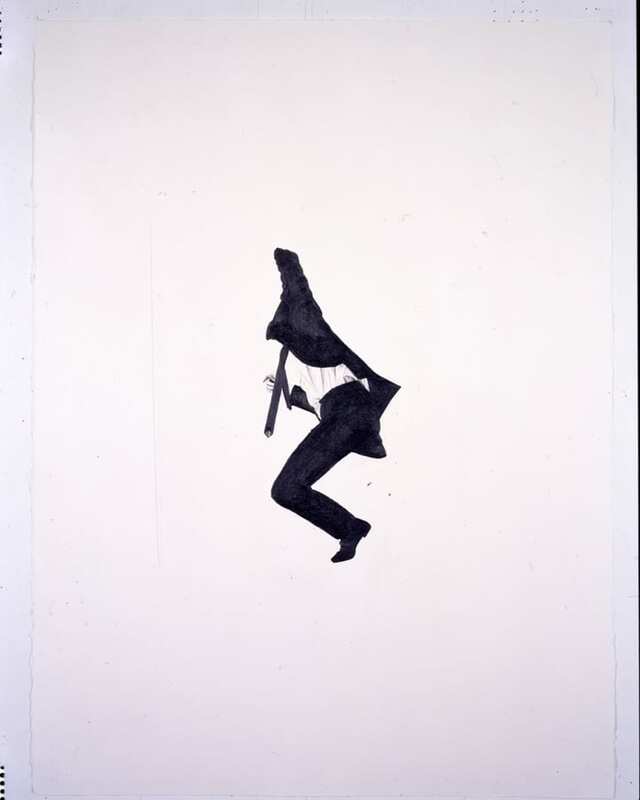 These messages of confusion were accompanied by evidentiary images that seemed to show that Haendel himself was now the subject of an act of copying, and the copier was none other than the artist Robert Longo. 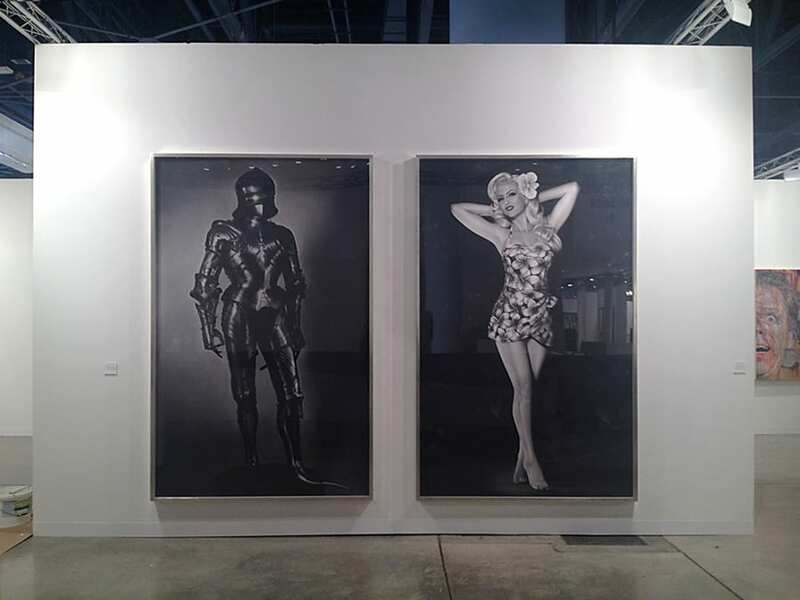 For on the wall of the Metro Pictures booth was a diptych composed of a life-size drawing in black charcoal of a knight in armor mounted next to a black charcoal drawing of the same size portraying a swimsuited female pinup wearing a hibiscus flower in her hair. The work was identified as Untitled (Adam and Eve), 2012, by Longo. 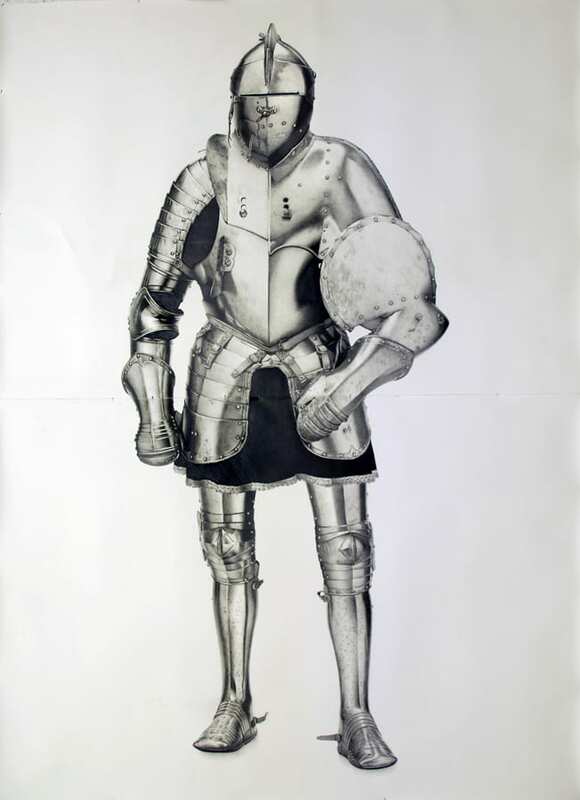 I should be explicit that the point of this narrative is to lay neither blame nor claim regarding the knight image but rather to draw out the differences in two works of art that look nearly identical and were arrived at via similar technical means, but which signify differently when contextualized within each artist’s broader practice and art-historical position. 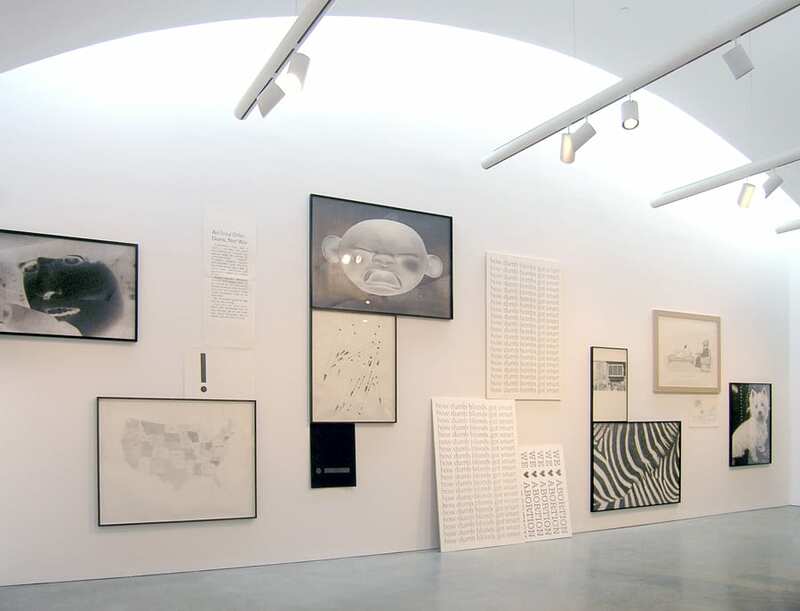 There are consequential differences, differences that register in interesting ways the transformation of the meaning and operations of appropriative strategies from their emergence in the late 1970s to the present moment in which they have passed into the hands of younger generations of artists. 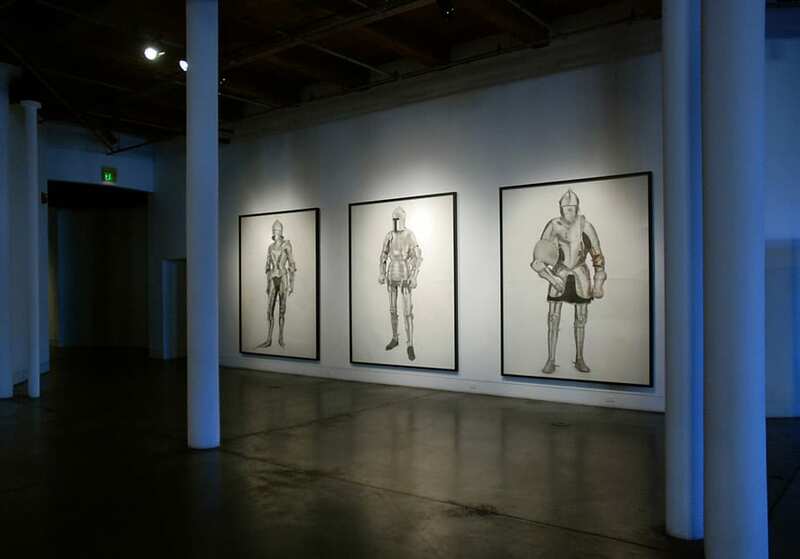 For his part, Haendel came to the subject of knights in 2009 as part of his ongoing interest in exploring and creating expanded, more nuanced models of male subjectivity in contemporary art. Haendel relates that he began to consider knight’s armor as emblematic of the perils of emotional detachment in men, a means of protecting against vulnerability that also delimits experience and feeling.2 His first knight was drawn from the only high-resolution image of full-body armor that he could find online. 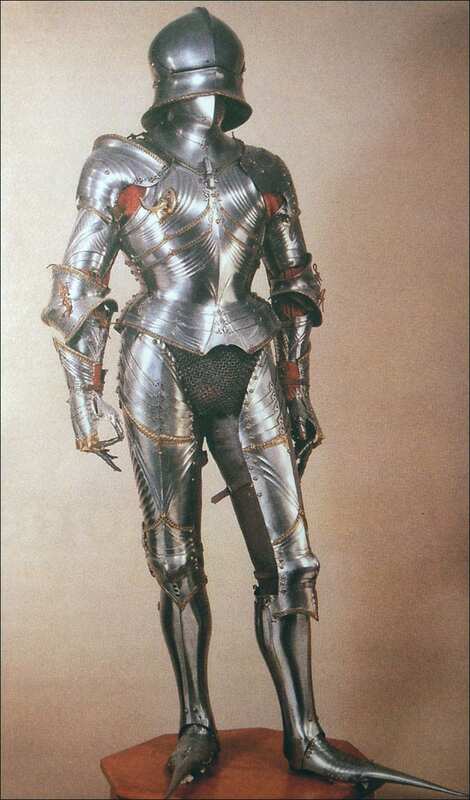 It turns out that finding high-quality images of medieval armor is challenging, not only because authentic full-body metal armor is rare, but also because the armor’s reflective surfaces make it difficult to photograph. 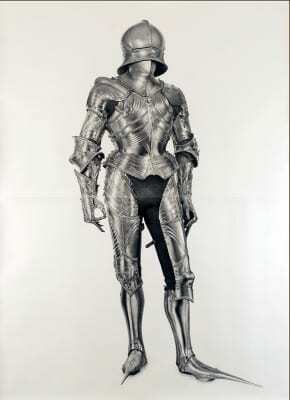 Haendel began searching for illustrated books on armor in libraries. He rented a full-body armor suit from a costume shop in North Hollywood specializing in historically accurate re-creations for film and television, and he wore the suit in a 16mm film made in 2010 that is reminiscent of the work of Jack Goldstein. 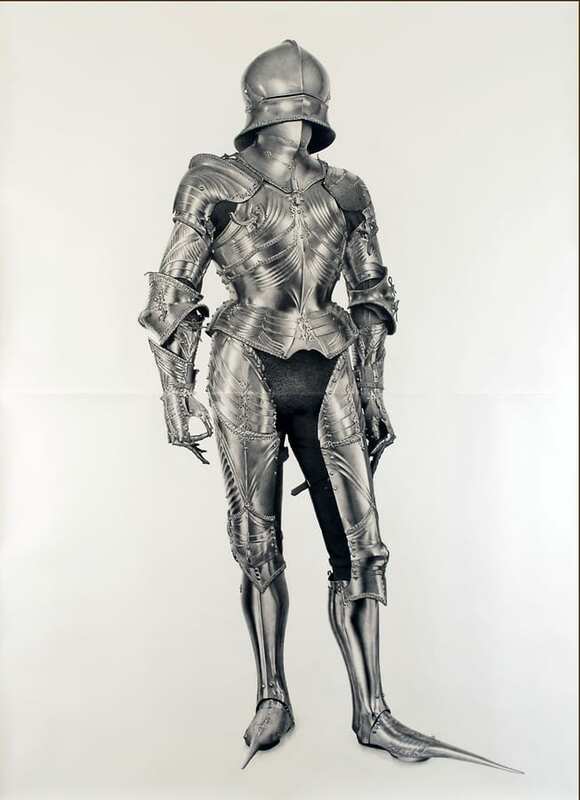 Having learned that high-quality photographs of complete suits of medieval armor are nearly as rare as the books in which they’re published, he also borrowed one of the shopkeeper’s books and photographed the images in it. 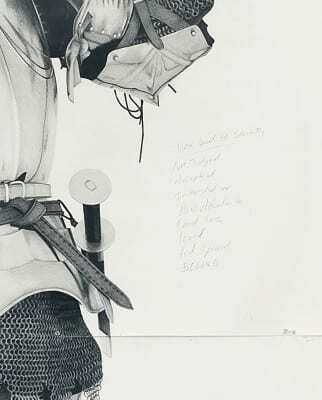 This is where he found the image he drew in Knight #2, unmistakable for the figure’s toe coverings, which double the length of each foot by extending outward in a single, bayonet-like talon, and, most especially, for the curious position of the left hand: the forefinger and thumb are joined to form a dangling “A-OK” sign. Only after Haendel had completed Knight #2 did the source image happen to make its way onto the Internet, in April 2012 as part of a post on a medieval enthusiast’s blog.3 Given the multitude of images that come up in Internet searches for knight’s armor, it is remarkable that Longo could have arrived at the same image for his Adam without knowledge of Haendel’s Knight #2. Could he or a studio assistant have happened upon the exact same book on armor as Haendel? Haendel’s quotational drawings after Longo’s Men in the Cities miniaturized the figures to the scale of Barbie dolls (he drew them on twenty-two- by thirty-inch paper, the smallest scale at which he works) and eliminated one of their legs each. The gesture effectually made some sense of Longo’s enigmatic images (now we know why they are falling), which had originally withdrawn their meaning in a characteristically obscure mode of postmodernist allegory. Haendel’s gesture also symbolically deflated the stature of a major artist of a previous generation. 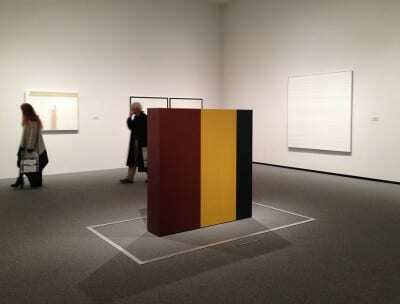 If his earlier monument to Anne Truitt (see “Episode One, 2000”) had been a sympathetic, honorific gesture of recognition whereby he recreated a sculpture of Truitt’s faithfully and in full—a gesture informed by his mentor Mary Kelly’s investment in the historical period of the 1960s and his search for art-historical mother figures to compensate for the loss of his own mother—here was Haendel’s juvenile moment of killing a father of 1980s appropriation art, the most recent art-historical canon that artists of his generation had to confront. Launching his career roughly twenty years later, Haendel was indebted to Longo for making it acceptable to center an art practice on drawing at all. Although Haendel has claimed that Longo was less important to him as a model than more conceptually driven figures like Robert Barry, Alighiero Boetti, Mel Bochner, Sol LeWitt, Robert Morris, Robert Smithson, Allen Ruppersberg, and Lawrence Weiner (and moreover Haendel maintains that many conceptualists were deeply concerned with craft), among these artists it is Longo who is most famously recognized as a draughtsman.7 Indeed the remarkable similarly between Haendel and Longo’s working processes could be seen to trump any privileged conceptual lineage in which Haendel would want to place his work: both artists make black-and-white drawings from photographic images, often appropriated (although Longo does this perhaps more so than Haendel, who uses a mix of appropriated and custom-made images). 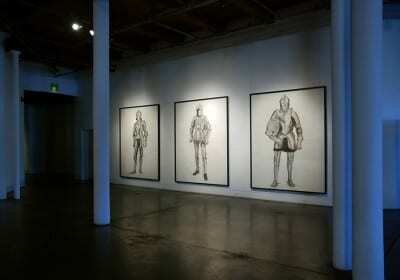 The images are enlarged from their original dimensions by means of a projector or grid system and drawn by hand. What Haendel’s Little Legless Longos importantly registered, however, is that the Longo of 2003/2004 was very different from the Longo of 1986. 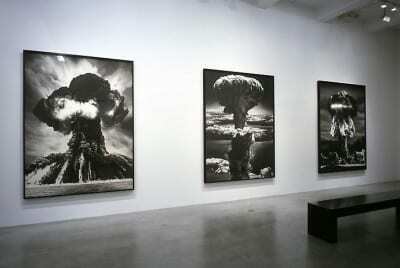 At the time Haendel began making the legless drawings, Longo’s most recent show at Metro Pictures, The Sickness of Reason, had featured enormous illustrations of nuclear explosions. The title of the exhibition implied a critique of the ends of scientific rationality, but nevertheless the drawings monumentalized and fixed as elegant each individual scene of destruction, from Nagasaki to Bikini Atoll, as an iconic image for aesthetic delectation. The suggestion of a postmodernist critique of representation or authorship had all but evaporated. Longo was still redrawing images in series, but his choice of subject matter along with the drawings’ craftsmanship and scale now seemed to celebrate the awesome beauty of the sublime image, with each presented as a singular masterpiece. 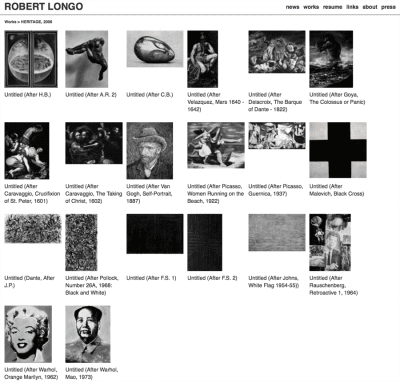 At age fifty, Longo seemed already to have entered what Edward Said has theorized as an artist’s “late style”—grandiose, irascible, and intransigent.8 By 2004 Longo had drawn nuclear explosions, tidal waves, rose blossoms, and pistols; soon would come sharks, planets, fighter pilot masks, cleavage, and sleeping babies. If Longo and Haendel’s drawings looked superficially alike, the Little Legless Longos were Haendel’s effort to distance himself from the twenty-first-century Longo. His miniaturized, legless, falling Longos critiqued the excesses of that artist’s contemporary work and were also a reminder—to Haendel and, perhaps optimistically, to Longo as well—of why Longo had become celebrated as an artist in the first place. 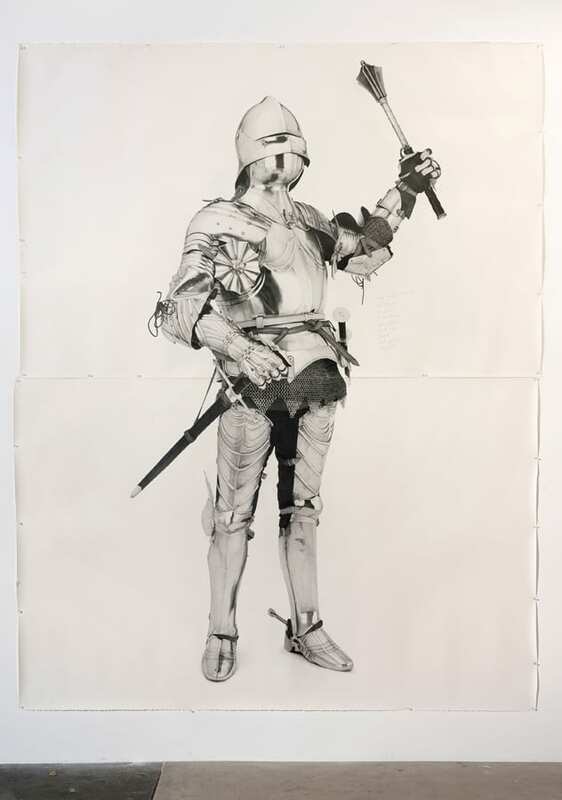 Returning to the coincidence of Haendel and Longo’s drawings of the same knight, isn’t it appropriate that what seems to have been Haendel’s first moment of recognition by an artist of the Pictures Generation occurred through an act of appropriation? Was it calculated on Longo’s part, or truly coincidental? If Longo indeed knew of Haendel’s knight drawing, how are we to understand the meaning of his act? 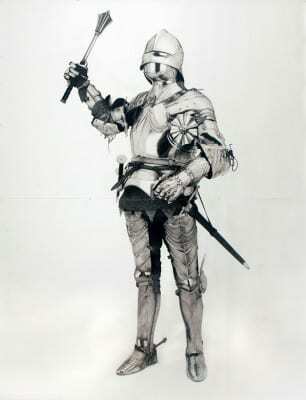 Because of Longo’s stature, does his knight “trump” Haendel’s knight? Or is Longo’s knight a knowing wink at Haendel, as if to say, in either a friendly or passive-aggressive way, I caught you? I pose these questions and leave them definitively unanswered for the reason that Longo has repeatedly declined to engage in dialogue with Haendel or about Haendel’s work. When both artists were included in the 2013 group show Graphite, curator Sarah Urist Green invited all participating artists to interview one another for the catalogue. Haendel’s request to interview Longo was declined by the artist’s studio, and there has been no contact between them since. In August 2015, Longo’s studio also declined my request for an interview on the topic of the relation between the two men’s work (this essay is in part a project to get these moves, countermoves, and avoidances on the record). So we are left to speculate upon the reasons for Longo’s refusal. One may be that, understandably, Longo rejects Haendel’s reading of his work, which seizes it as a historical type indexed to a decidedly past moment in art history. Furthermore, Longo’s interests seem to have moved on from a critical engagement with visual semiotics, and the artist therefore may not want to foreground appropriation as the dominant framework for understanding his practice. We may never know. In any case, despite the obvious connections between Longo and Haendel’s work there are crucial differences between their twin knights, which deserve close reading and disentangling. If both Longo and Haendel’s knights offer a wry take on stereotypical ideals of male subjectivity (and in the case of Longo’s Untitled (Adam and Eve), of female subjectivity too), Longo’s knight remains a heroic figure nonetheless. 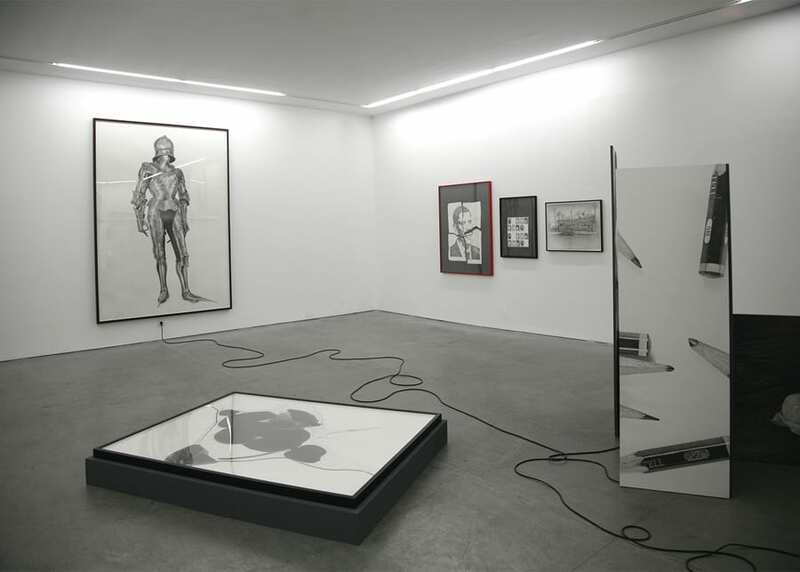 A replication of the found image in toto, his knight stands with confidence on a solid platform and is framed by dark shadows. Haendel’s knight, meanwhile, stands on nothing; it is set adrift, stranded in the middle of a white page, devoid of all worldly context (as Longo’s Men in the Cities had been). Notes from Haendel’s therapy sessions scrawled next to other knights in the series further cast them as insecure, pathetic, and emotionally impotent. Next to Knight #8 Haendel has listed feelings that lead to a sense of security: “not judged, accepted, interested in, paid attention to, cared for, loved, feel special, BELONG”—as if the knight before us has somehow exposed himself. But all there is to see is a mute metal object in a human shape. Where Haendel’s unmoored knights ultimately find context is in the groupings of drawings the artist assembles when his work is displayed in exhibition. Very rarely does a Haendel drawing appear alone, for his working process is opposed at every turn to the singular image. Haendel finds or creates photographic images, converts them to 35mm slides, and catalogues them in an idiosyncratic system of categories. The typology of Haendel’s image archive runs roughly from Abstracts to X-Rays, including categories such as Babies Crying, Hitler, Local Churches, and Tupperware in between. Longo too constitutes a category, and each of these categories is populated by multiple images. The drawings Haendel makes from these images are typically done in multiple as with the several knights, and the finished drawings become part of a second inventory that Haendel assembles into groups for specific exhibition contexts. Individual drawings may be pulled into different groups on different occasions, each time contributing to a particular, momentary visual syntax that is liable to be radically transformed the next time it appears. (That is, until a particular grouping enters a collection as a group—but then Haendel can always redraw an image from his slide bank, effectively appropriating himself.) 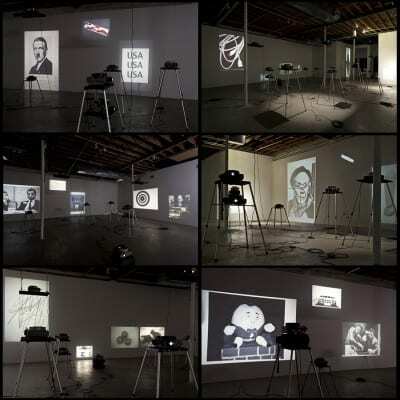 To underscore the radical provisionality of his practice of arranging the finished drawings, Haendel has exhibited his slide collection as ever-changing room-sized installations, in which slide projectors mounted at varying heights and distances from the walls project edited selections from his archive.16 With each slide carousel organized by the artist according to specific thematic connections, the chorus of projectors creates indeterminate juxtapositions as the machines churn through their carefully edited contents. 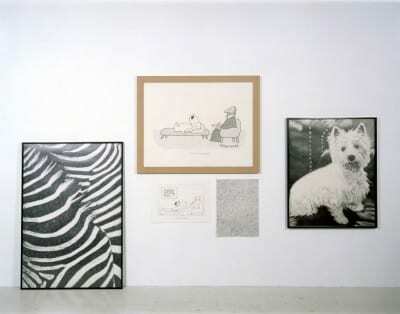 In Haendel’s porous and cross-referencing taxonomies, an image can be readily appropriated from one category to the next. If an image of Bob Dylan signifies America in one installation, it may go on to represent Masculinity/Heroes/Anti-Heroes in the next. There is an analogy to be made between Haendel’s syntactical practice and the workings of language, which other writers have readily identified.17 Indeed, the individual drawings are for the artist integers, words, syllables, or even discrete phonemes that come in and out of relation with one another, suggesting different meanings depending on how they are grouped. 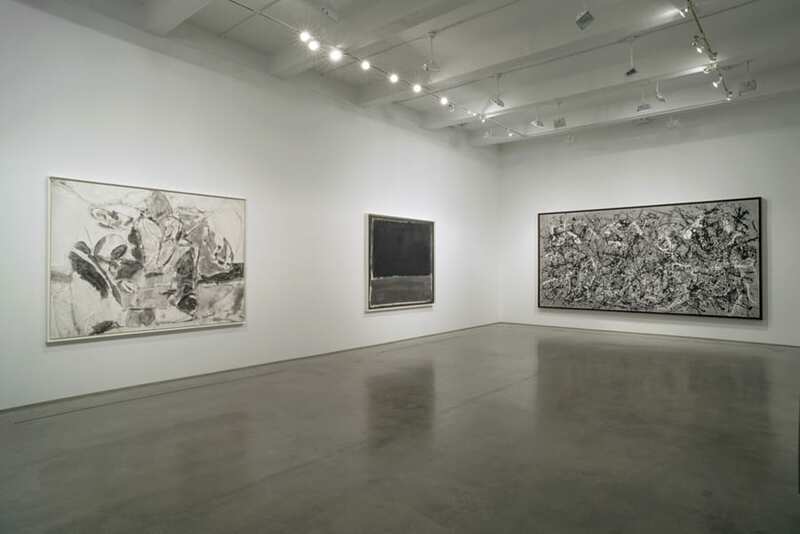 From commonly recognizable cultural material, Haendel builds allusive visual syntaxes. In this way, his entire oeuvre can be seen as an ever-shifting, contemporary mnemosyne atlas, one that recognizes visual culture as a language of aesthetic types and codes used and shared between us but owned by no one. “All ‘types’ of images have already been produced and there is nothing new there,” Haendel has said.18 “I’m not the author of the image. 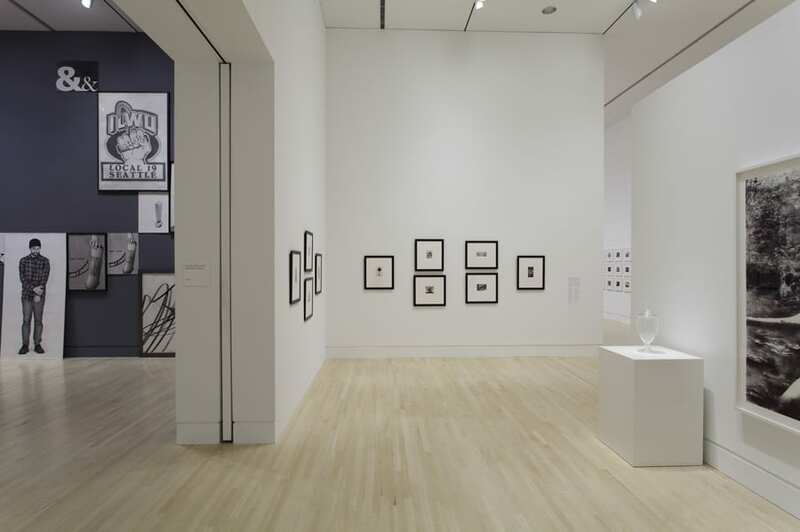 The image belongs to culture at large, and I am only involved in the chain of passing it on.”19 Haendel envisions his inventory of images as part of an endless chain of images connected by the logic of and . . . and . . . and . . ., a logic emblematized by the interbraided loops that make up the logo of his book publishing imprint, Double Ampersand Press (&&). If not Longo, there is at least one artist associated with the moment of the 1980s with whom Haendel feels consciously affiliated. 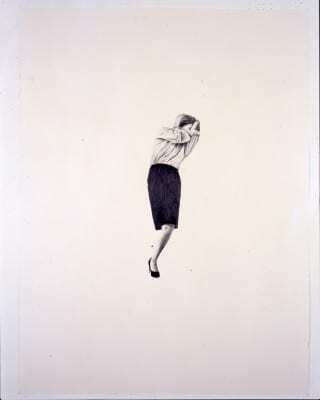 The young artist first began to think deeply about the interrelations of image- and object-types while working as a studio assistant for Haim Steinbach over the course of three years, beginning during his time in the Whitney Independent Study Program in 1998–99 and continuing until his move to Los Angeles. Steinbach’s readymade consumer items, set on shelves in careful arrangements, invited thinking about how we read objects individually and in relation to one another according to material, historical, and metaphorical registers. 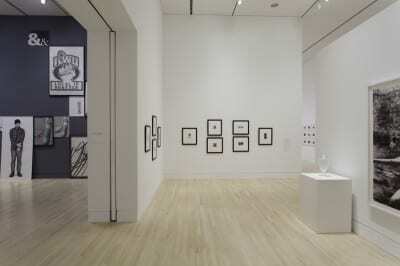 What’s more, Steinbach loved shopping and loved the objects he chose to work with. He was an artist from whom Haendel learned very directly that the act of collecting and reframing readymade cultural products could be a gesture of affection, engagement, fascination, affiliation, and identification.23 In Haendel’s installations there are typically no shelves, but clearly there is a similar dynamic of careful placement and display at work. 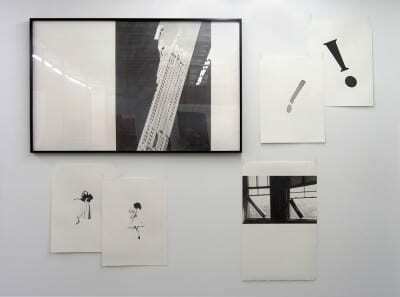 The spaces between one drawing and the next are as crucial as the individual works themselves. In 2005, Haendel showed two of his Little Legless Longos at Anna Helwing Gallery in Los Angeles as part of a grouping around the theme of impotence that also included his drawn reproductions of the following: exclamation points tilting as if falling, an allusion to the feeling of ineffectuality surrounding street protests against the Iraq War; the Trump Building at 40 Wall Street, for a brief time—less than a month—the tallest building in the world; and a temporary, site-specific gallery intervention by Kishio Suga, Limitless Situation (Window), 1970, in which the artist propped opened adjacent windows at the National Museum of Modern Art in Kyoto with blocks of wood. Precarious erections all. It would be entirely appropriate to call Haendel’s loose associations of images, which suggest unexpected or illogical connections between disparate things, an example of knight’s-move thinking.